This entry was posted in news and tagged MINI 4 Door on June 4, 2014 by James Day. 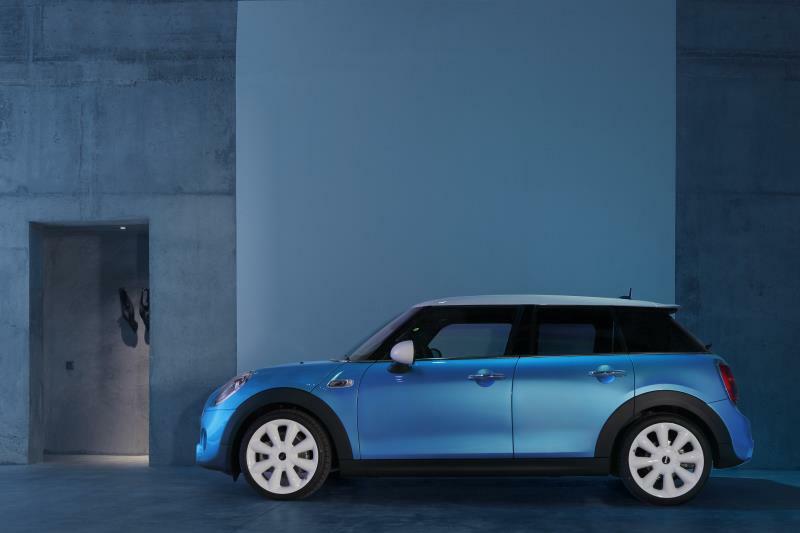 The new four-door (plus hatch) MINI Hardtop debuted today with the odd name MINI 5 door. This model is a bit over 6.3″ longer than the Hardtop with a 2.8″ longer wheelbase. Market launch of the new MINI 5 door with four model variants (combined fuel consumption: 5.9 – 3.6 l/100 km, combined CO2 emissions: 136 – 95 g/km); two petrol and two diesel engines of the new generation available with MINI TwinPower Turbo Technology; MINI Cooper 5 door with 100 kW/136 hp 3-cylinder petrol engine, MINI Cooper S 5 door with 141 kW/192 hp 4-cylinder petrol engine, MINI Cooper D 5 door with 3-cylinder diesel engine (85 kW/116 hp) and MINI Cooper SD 5 door featuring new 4-cylinder diesel engine presented for the first time with an output of 125 kW/170 hp; 6-speed manual transmission as standard, 6-speed Steptronic transmission or Steptronic sports transmission as an optional extra; extensive MINIMALISM technology including auto start/stop function and optional GREEN mode. Typical MINI go-kart feeling thanks to model-specific set-up of suspension technology, with single-joint spring strut front axle and multilink rear axle; maximum agility due to weight-optimised construction with a high degree of stiffness; electromechanical power steering with Servotronic function as standard; Dynamic Stability Control (DSC) as standard including Dynamic Traction Control (DTC) and Electronic Differential Lock Control (EDLC) in the MINI Cooper S 5 door and MINI Cooper SD 5 door also with Performance Control; model-specific spring and damper set-up; Dynamic Damper Control optionally available; standard trim includes light alloy wheels in 15-inch format (MINI Cooper 5 door, MINI Cooper D 5 door) or 16-inch format (MINI Cooper S 5 door, MINI Cooper SD 5 door); light alloy wheels optionally available up to 18 inches. Weight-optimised and crash-optimised body structure; standard safety fittings include front and side airbags, side curtain airbags, 3-point automatic belts on all seats, at front with belt tensioners and belt force limiters, twin ISOFIX children’s seat attachments at rear and optionally also on the front passenger seat, tyre pressure control and partially active engine compartment lid for optimised pedestrian protection; optimised vehicle weight; excellent acoustic and vibrational comfort; favourable aerodynamic properties. CO2 emissions*: 136 – 139 g/km (125 – 128 g/km), exhaust emission standard: EU6. CO2 emissions*: 109 – 111 g/km (111 – 114 g/km), exhaust emission standard: EU6. average fuel consumption*: 4.1 – 4.3 litres (4.1 – 4.2 litres)/100 kilometres, CO2 emissions*: 109 – 112 g/km (107 – 109 g/km), exhaust emission standard: EU6. CO2 emissions*: 95 – 97 g/km (99 – 102 g/km), exhaust emission standard: EU6. * Fuel consumption depends on the selected tyre format.